Hand carved out of Suar wood by Balinese artists. Suar wood is a two toned wood and so you will get variations in the color of the carvings. OM Hand Carved Wood Wall Art. In Hinduism, Om is one of the most important spiritual symbols. Connoting inner balance, contemplation, and tranquility, this statue is the perfect size for placing on display on a shelf or table. STUNNING LARGE BUDDHA FACE! WALL HANGING SCULPTURE. Materials : Wood Handmade 100 %. I can reply you in 24 hours. My dear friend. We will resolve it for you in 48 hours. SIZE:26.5 x 26.6 cm. Amazing Handmade Wood Wall Hanging Sri Lankan Cobra Bird Mask Art Sculpture 15"
100% HANDMADE INTRICATE DESIGNS. Material :Wood (Diya Kanduru). These masks are great for indoor or outdoor use. Width :19" Height: 15". Symbolism of the. All masks that are on display and for sale have been patiently hand carved with very detailed designs and painted in vibrant colours which depicts the traditional inheritance. Large Thai Angel Wall Art Hand Carved Teppanom Teak Wood Wall Carving Panel 36"
A strong, bright & cheerful golden sun face, carved wood. & hand painted wall hanging from Nepal. THAI ELEPHANT TEAK WOOD HAND CARVED WALL HANGING. Elephant Hand Carved From Teak Wood 100%. Materials : Teak Wood 100 %. ART SCULPTURE STENCIL PRIMITIVE. Color : Black and Brown (as picture). Product Features. Hand carved in Bali by talented artisans using ages old techniques with simple hand tools. This is carved in the traditional Om ॐ simple and sweet, polished too a deep brown finish, this unique wall art will go with many types of decor'. This Floral Oriental Teak Wood Sculpture Hanging Wall is hand carved by local people here in Thailand. Large Carved Wood Panels. Decorative Thai Wood Carving. Carved Wall Decor. Made from wood. It is hand carved and hand painted by C.M.C.V. They are sold as a set (set of 2 panels). Beautiful handmade art. Sacred Om Mantra ॐ Wall Art Plaque Relief Panel Hand Carved wood Balinese 3.75"
Material: Teak Wood. Brown Finish 17.5”x7.5”x1" Each, Set of 2 pcs. Also, since most products are handmade and they are crafted from natural wood, there may be a slight size variation. Color: Brown. Type: Indian Puppets Style: Asian/Oriental. Does Not Apply. Does not apply. Multi-Color Country/Region of Manufacture: India. Hand Made Large Heavy Brushed Steel. BEAUTIFUL PIECE OF ART. 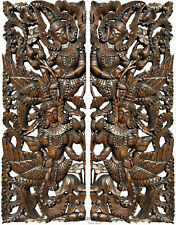 It has been hand carved by the highly skilled and experienced local artisans from Nepal. The handcrafted nature of this product will produce minor differences in design, color and sizing. Good news! The back looks rested but it’s in excellent condition. Connoting inner balance, contemplation and tranquility, this statue is the perfect size for placing on display on a shelf or table. STUNNING LARGE BUDDHA FACE. Style : Asian Oriental, Buddha. Materials : Wood 100 %. Carved wood wall art lucky elephant. Rustic Brown Finish 17.5”x7.5”x1" Each, Set of 2 pcs. Material: Teak Wood. Color: Rustic Brown. Also, since most products are handmade and they are crafted from natural wood, there may be a slight size variation. Decorative Thai Wood Carving. Carved Wall Decor. Dark Brown Finish 35.5”x13.5”x1" Each, Set of 2 pcs. Material: Teak Wood. A really unique exhibition of creative wall art! Also, since most products are handmade and they are crafted from natural wood, there may be a slight size variation. Connoting inner balance, contemplation, and tranquility, this statue is the perfect size for placing on display on a shelf or table. STUNNING LARGE BUDDHA FACE. WALL HANGING SCULPTURE. Each piece is individually crafted so slight differences in color and wood grain will appear. VINTAGE LARGE WOOD ART CARVED BUDDHA FACE MASK WALL HANGING SCULPTURE DECOR OLD! This is face or mask Buddha statue is the perfect size. STUNNING LARGE BUDDHA FACE. 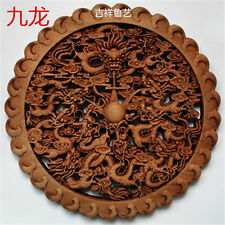 WALL HANGING SCULPTURE DECORATION OLD. Ancient Style. (Each piece is individually crafted so slight differences in color and wood grain will appear. ). This Floral Oriental Teak Wood Wall Hanging is good hand carved by local people here in Thailand. This is Thai Wood sculpture depicts the head of the Buddha. STUNNING THE BUDDHA. Style : Asian Oriental and Buddha. WALL HANGING SCULPTURE. Materials : Wood Hand Carved 100 %. Color : Brown(Face), Gold(Head). Connoting inner balance, contemplation, and tranquility, this statue is the perfect size for placing on display on a shelf or table. STUNNING LARGE BUDDHA FACE. Style : Asian Oriental, Ancient. Materials : Wood Handmade 100 %. VINTAGE LARGE WOOD ART BRONZE CARVED BUDDHA FACE WALL HANGING SCULPTURE DECOR! Connoting inner balance, contemplation, and tranquility, this statue is the perfect size for placing on display. New Bronze Style Shade. STUNNING LARGE BUDDHA FACE. WALL HANGING SCULPTURE. Thai Art Hand Carved. This sculpture is a handcrafted work with a good quality of hard wood. - Martial : Hard Wood. Large Thai Angel Wall Art Hand Carved Teppanom Teak Wood Wall Carving Panel 35"
Hand Carved Teppanom or Thai Angels Teak Wood Wall Panel. Very solid and heavy (weighs 7 lbs.). teak wood stained dark brown and brushed with a luxurious royal gold paint. Stunning ornate details hand carved by traditional craftsman of the Hmong Tribe of northern Thailand. Connoting inner balance, contemplation, and tranquility, this statue is the perfect size for placing on display on a shelf or table. STUNNING LARGE BUDDHA. Style : Asian Oriental Hand Carved. New White Ancient Style. Elephant Hand Carved. Thai Hand Carved decorate house,Material from Wood 100%. T his statue is the perfect size for placing on display on a shelf or table. Materials : Wood Hand Carved 100 %. Product Features. Here, great wood hand carving wall art item that quite perfect for contemporary decor. Art Sculpture Hanging Wall Plaque Decor. Condition : 100% Natural Wood, Hand Carved, New & original by Thai Local Artist, Thailand. They are sold as a set (set of 3 panels) A really unique exhibition of creative wall art! Perfect for large wall decoration. Made from teak wood. Buddha and Floral Panel Wall Art. Large Carved Wood Panels. THAI ELEPHANT TEAK WOOD CARVED WALL HANGING ART PANEL SCULPTURE HANDCRAFTED! Elephant Hand Carved. Thai Hand Carved decorate house,Material from Wood 100%. This statue is the perfect size for placing on display on a shelf or table. Materials : Wood Hand Carved 100 %. Product Features. Condition : New Handmade. Quantity : 1 piece. Product from : Thailand. They are sold as a set (set of 3 panels) A really unique exhibition of creative wall art! Perfect for large wall decoration. Made from teak wood. Large Carved Wood Panels. Decorative Thai Wood Carving. Hand Carved Fro. m Wood 100%. Materials : Wood 100 %. Color : (as picture). or place in your worktable. Product Features. Weight : 100 g.
Wooden hand-painted engraved hand painted gold plated Asian culture. size A 4.1 / 8 " high, 12". Large Carved Wood Panels. Decorative Thai Wood Carving. Carved Wall Decor. Dark Brown Finish 35.5”x13.5”x1" Each, Set of 2 pcs. Material: Teak Wood. A really unique exhibition of creative wall art! OM has been carved in the wood by hand by the highly skilled and experienced local artisans in Nepal. Sanskrit Om Wall Hanging. Color may slightly vary as picture taken from the random piece. We are like you guys searching for an answers.like who are we?. Connoting inner balance, contemplation, and tranquility, this statue is the perfect size for placing on display on a shelf or table. VINT AGE WOOD HAND WHITE ART CARVED BUDDHA. Right and Left Hand Buddha. Connoting inner balance, contemplation, and tranquility, this statue is the perfect size for placing on display on a shelf or table. 14"ART WHITE HAND WOOD CARVED PANEL WALL. White H ands Thai Buddha decorate house,Material from Thai Wood 100%, White Color, Handmade Carved & Made in THAILAND. TEAK WOOD PANEL. Elephant Hand Carved. Thai Hand Carved decorate house,Material from Wood 100%. This statue is the perfect size for placing on display on a shelf or table. Materials : Wood Hand Carved 100 %.